Some are driving the cancer's growth, while others are just along for the ride. So which ones are important? The researchers analysed the DNA from 7,664 tumours to find "driver mutations" that allow a cell to be more selfish, aggressive and cancerous. 10 mutations to create a colorectal cancer. Dr Peter Campbell, one of the researchers, told the BBC News website: "We've known about the genetic basis of cancer for many decades now, but how many mutations are responsible has been incredibly hotly debated. "What we've been able to do in this study is really provide the first unbiased numbers. "And it seems that of the thousands of mutations in a cancer genome, only a small handful are responsible for dictating the way the cell behaves, what makes it cancerous." Half the mutations identified were in sets of genetic instructions - or genes - that had never been implicated in cancer before. The long-term goal is to advance precision cancer treatment. If doctors know which few mutations, out of thousands, were driving a patient's cancer, it could allow drugs that specifically targeted that mutation to be used. Drugs such as herceptin and Braf inhibitors are already used to attack specific mutations in tumours. The researchers were able to pick out the mutations that were driving the growth of cancer by turning to Charles Darwin and evolutionary theory. In essence, driver mutations should appear more often in tumours than "neutral" mutations that do not make the cell cancerous. This is because the forces of natural selection give an evolutionary advantage to mutations that help a cell grow and divide more readily. Dr Nicholas McGranahan, from the Cancer Research UK and the UCL Cancer Institute, said the approach was "elegant". 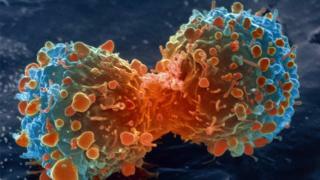 He said: "Cancer is a disease that evolves and changes over time, and it makes sense to use ideas like this from species evolution to work out the genetic faults that cause cancer to grow. "But as this study focuses on one part of cancer evolution, it can only give us insight into part of the puzzle. "Other components such as how DNA is packaged into chromosomes are also key in how a tumour progresses and will need to be looked at to give us a clearer picture of how cancer evolves."